Take a deep breath and relax! This unique formula offers the support to keep your nasal airways clean and not irritated. Because you want natural, lasting relief. When pollution and allergens strikes, reach for something natural. You don’t want harsh, addictive chemical solutions. You want to soothe the membranes and moisturize the dry, irritated nasal passageways. You want Congestion Relief™. This all-natural product uses Horseradish Root, Elder Flower and Yarrow Leaf to support in the relief of swollen nasal membranes. Then Eye Bright and Calendula help support and soothe the membranes. Finally, Aloe Vera supports the restoration of tissues while the Grapefruit Seed Extract helps maintain a healthy fauna and flora. All these herbs are provided saline solution to bathe and moisturize the sinuses. Using natural herbal constituents to support the nasal membranes to produce their own anti-inflammatory agents through phytogenomic activation. Support, soothe, and moisturizing of the membranes with calendula and Aloe Vera. Relaxing the sinuses naturally so that you don’t become dependent. Horseradish Root, Elder Flower and Yarrow Leaf support in the relief of swollen nasal membranes. Eye Bright and Calendula help in the structural support and soothing the membranes. Aloe Vera supports the natural process of moisturizing and restoration of the nasal tissues. Grapefruit Seed Extract helps to maintain a healthy fauna and flora. It can cause poor sleep and lead to closed nasal passageways. Break that cycle naturally by soothing and relaxing irritated sinuses. 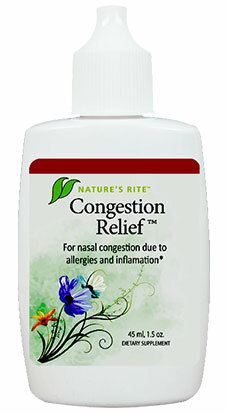 You can order a bottle of Congestion Relief™ and be on your way!